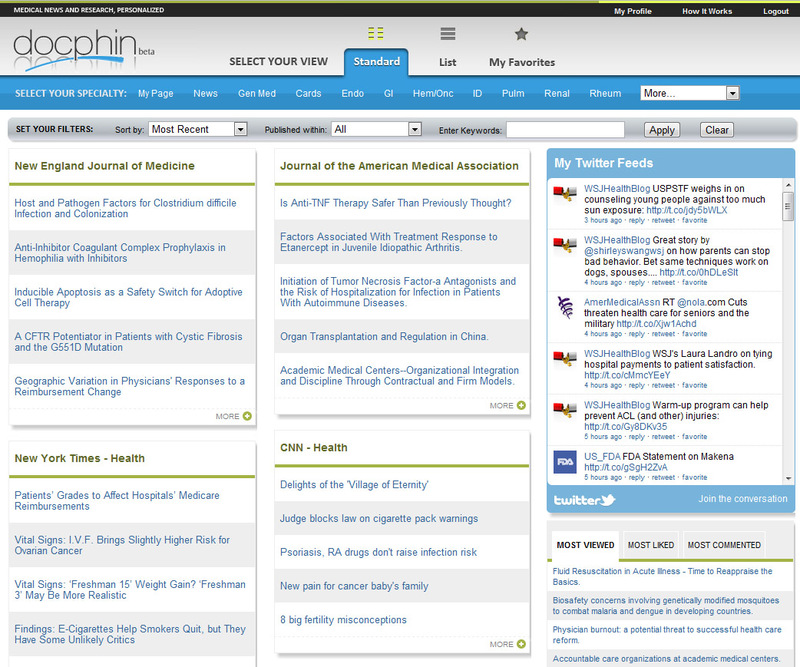 Today, Docphin is launching a new Web service the company likens to a “Bloomberg for Doctors.” The site aims to help physicians organize, bookmark, read and track medical news and research from a number of sources, all within a single dashboard interface. Included with the service are simple tools to view and filter through hundreds of medical journals, something which has been difficult to do using traditional research methods. The service even offers a built-in personalized Twitter widget for keeping up with medical societies, sources and other leaders in a doctor’s given speciality. One of the most important things to know about Docphin is not the sum of its features, but who’s behind it. This is a company built by doctors-slash-entrepreneurs who have direct knowledge of what their fellow physicians need. The service’s founders include Mitesh Patel, Derek Juang and Sachin Nanavati. In addition to being an entrepreneur, Patel is also a physician and clinical researcher, and has served as the business development consultant for more than ten healthcare startups. His research has been featured in the New England Journal of Medicine and The New York Times. Meanwhile, prior to Dochpin, Nanavati worked at IMS Consulting Group, which specialized in global strategies for pharmaceutical clients. He also has an MBA in Healthcare Management from Columbia Business School. Finally, Juang, like Patel, is an MD. He currently works as a staff physician at the Department of Veterans Affairs San Diego Healthcare System and as an Assistant Professor of Clinical Medicine at the University of California in San Diego. Essentially, the concept for Docphin is that of a personalized news dashboard – something which numerous startups have built in the past, but mainly for consumers. Like any good news dashboard, Docphin is simple to set up and use. 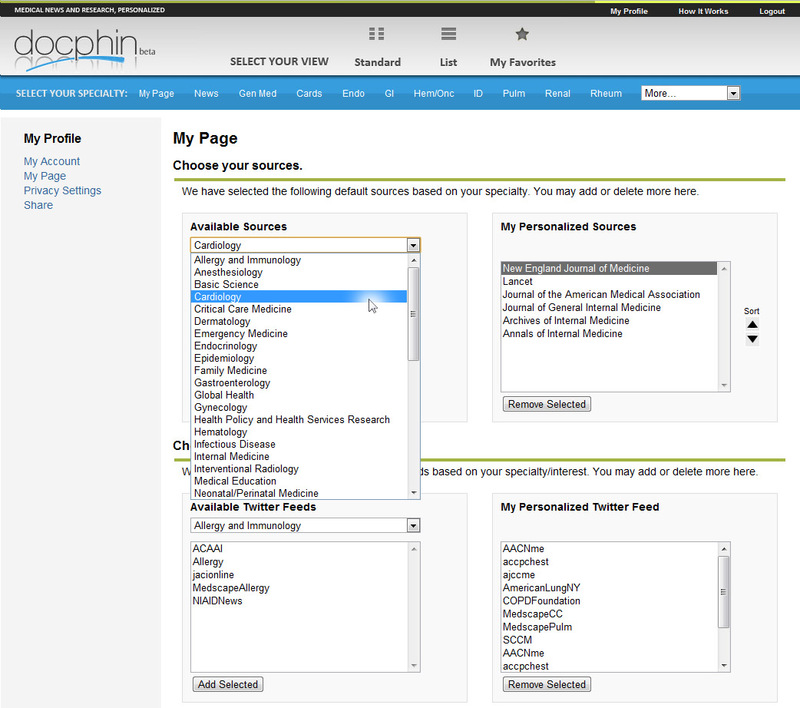 In less than five minutes, a new user can create their own page to aggregate information from medical journals, news media and Twitter feeds. The site’s filters and tools let doctors sort and browse through the articles, share articles with their colleagues, start discussions by posting comments, bookmark articles for later reading and more. Docphin has been in testing for over a year, and has established partnerships with three academic medical centers: the University of Pennsylvania, the University of Michigan and the University of California-San Diego. The company plans to expand nationwide in 2012. Docphin is currently self-funded and looking for angel and VC funding.